Moving house can be a stressful time of your life – there is a great deal of emotional upheaval together with physical and mental strain. Moving to a new city within a country can be challenging, but moving to a new country entirely can present a whole different range of challenges. One huge consideration that is an important factor for many people is their pets. Pets are part of the family – pets are our companions and we build a close bond with these furry friends. We love our pets and would do anything to ensure their happiness. When purchasing or renting a new property, if you have a pet you must consider their well-being too – are there any laws regarding pets? Is your new property suited for pets? Are you even allowed to keep pets in your property? Before we look at the acceptance of pets in Thai properties, it is important to understand a little about the actual pet culture within the country – do people have pets? Is there an abundance of Vets? What about pet stores and pet-friendly parks? Vet Care – Generally, Thailand has a high standard of medical care for animals. You can easily find vets within cities and large towns and also 24-hour emergency services. The vet bills are usually reasonable too. – One thing you will notice is the abundance of street cats and dogs throughout Thailand – this is something that should be given consideration. – Pet supplies are readily available in most Thailand supermarkets such as Tesco Lotus and Makro. Furthermore, Thailand has a range of private pet stores that offer a superb range of food, toys and accessories. When considering pets and properties in Thailand, it is important to make a distinction between Bangkok and the rest of the country – Bangkok has a different approach to pets than other cities such as Chiang Mai and Khon Kaen, this is mainly due to the layout, infrastructure and type of properties available. – Generally, Bangkok is NOT a place for pets. The city is just not an ideal location for pets, especially large dogs. There are many contributing factors such as the hectic traffic, a lot of skyscrapers and high-rise buildings, plus the abundance of condo developments. Many condo owners do not allow pets – this is mainly to avoid upsetting other residents. Furthermore, pets are rarely permitted in high-rise structures. 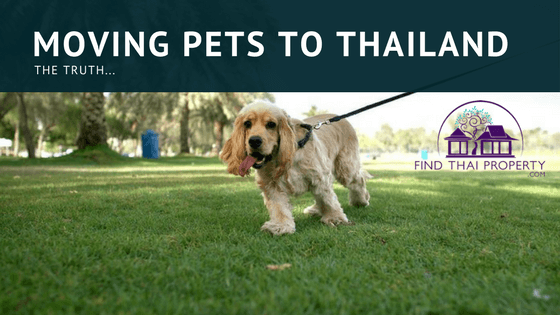 This doesn’t mean that there aren’t any pet-friendly properties in Bangkok, but you must certainly put a great deal of effort into finding one. – This is where things become easier for pet owners. Generally, the smaller towns and cities within Thailand are pet-friendly. This holds true especially in coastal areas where properties tend to be private detached houses or villas. You will find it a great deal easier to find a pet-friendly property and the attitude towards pets is much more relaxed. Hopefully, this article will have given you great insight into Thailand and pets – one final thing worth noting is that if you do need a pet-friendly property, it is always advisable to contact the owner/estate agent first to ensure pets are accepted – regardless of what their advertising states. Read more: Move to Thailand with a cat or a dog.